A while back I reviewed a game called Vertical Drop Heroes where you would try to progress through several vertical levels but whenever you died you’d keep any progress made on your characters. The more you progressed the more your characters would improve which in turn meant you could progress further and further. Now take that concept and turn it into an RPG with elements of a deck building game and you have Monster Slayers in a nutshell, which makes sense since the game was developed by Nerdook, the same team who developed Vertical Drop Heroes. 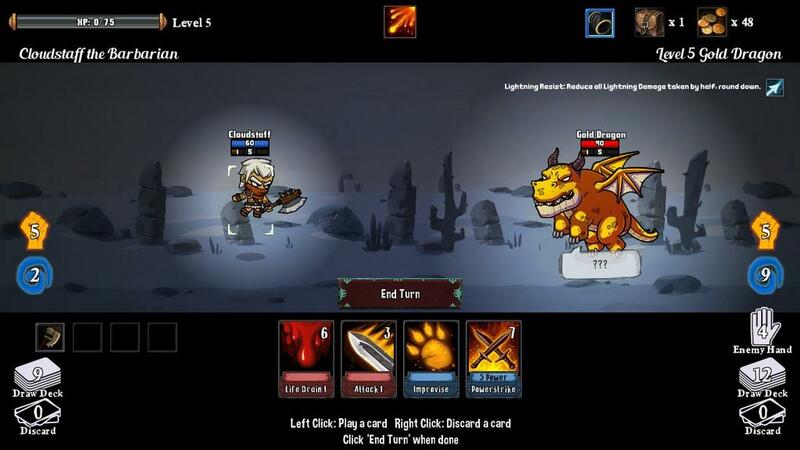 When you start the game you can choose from one of several different classes such as a knight, wizard, and dragon…yes, a dragon (more classes can be unlocked as you play), and each class has their own starting deck of cards they’ll use in battle as well as possibly some starting gear to improve their stats. Once you choose your class and gear up on the inventory screen you’ll head on out to the map screen to choose your destination. The goal is to defeat three legendary monsters to become a true Monster Slayer. Each class will have three locations to choose from and after clearing one location they’ll have three more to choose from. It doesn’t matter which location you choose because the next set of three levels after clearing one will have tougher enemies. 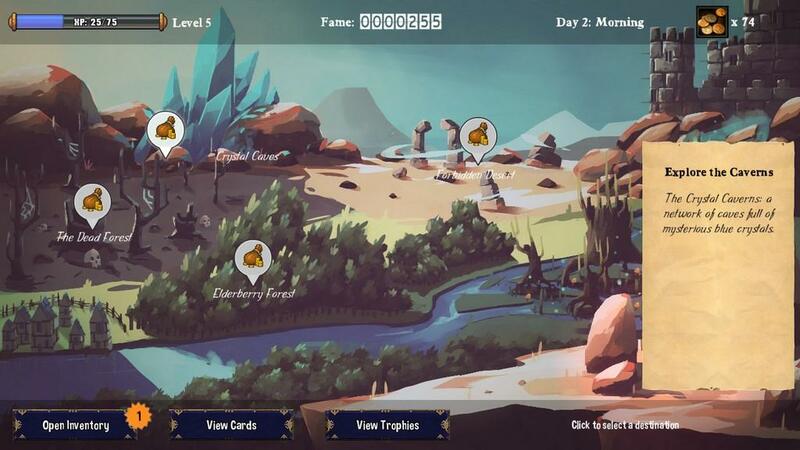 At the start of each dungeon you’ll choose from one of two NPCs that can help you out with a special effect such as giving you more Action Points or allowing you to negate the next two cards an opponent plays. You can even name the NPCs yourself if you wish. Each of these effects have a cooldown timer so it’s imperative to decide the best time to use them (most early on are usually two or three battles). After clearing out a level and starting the next you can get another NPC to help you out, giving you another ability to make use of. Not to mention you’ll eventually start coming across NPCs you’ve already met that will help you out in your quest. Each location has a map of multiple squares that you can travel to and as you visit a square, more will open up as indicated by some white dots. The most common rooms you’ll find are monster rooms which contain a monster to fight. This is where the deck building game aspect comes into play. Each class will have their own starting deck and by default you get three cards in your hand each turn, three action points, and some mana. While mana generates over each turn, you always get three action points to start a round with (unless something gives you more). 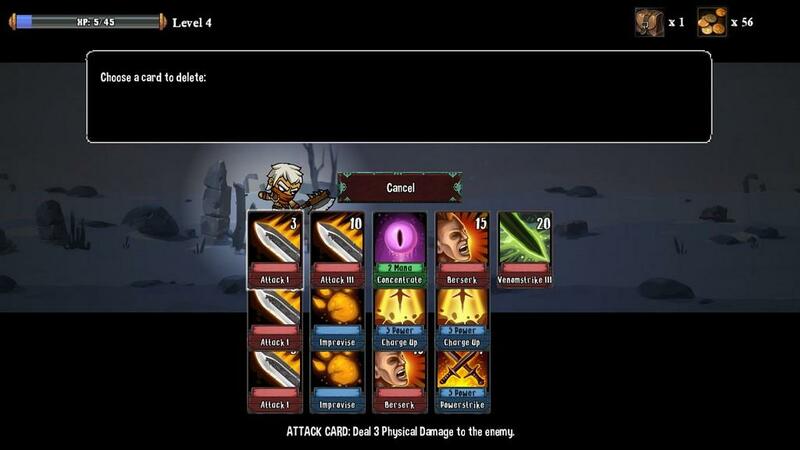 Cards in the game include attack and support cards, such as potions or cards to generate mana. 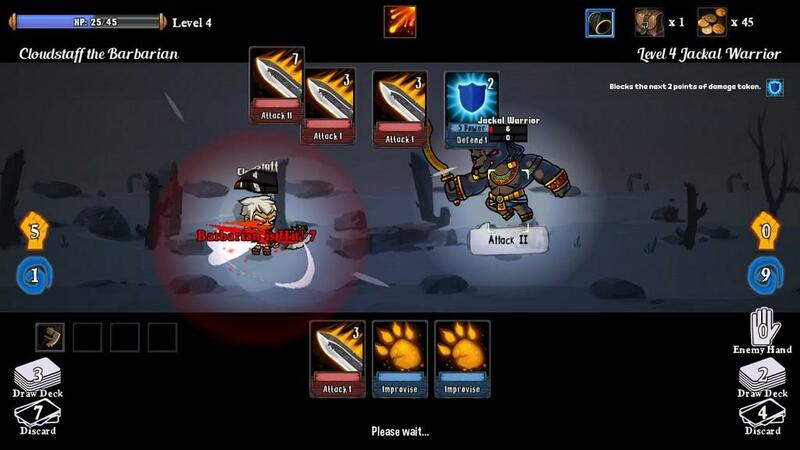 Your gear is also factored into things such as your damage output and defense. Once you run out of cards or don’t have any more action points or mana to do anything, your turn ends and the monster will take its turn. This keeps going until either you or the monster dies. Other squares in the locations include a Merchant to buy new gear and cards from, Healers to heal your HP, Altars to give you some sort of buff, though usually at a sacrifice of some sort, Captains to give you another card for your deck, and other NPCs to give you some XP or another card. As you defeat monsters you’ll gain experience like in any other RPG and after gaining a certain amount you’ll level up. 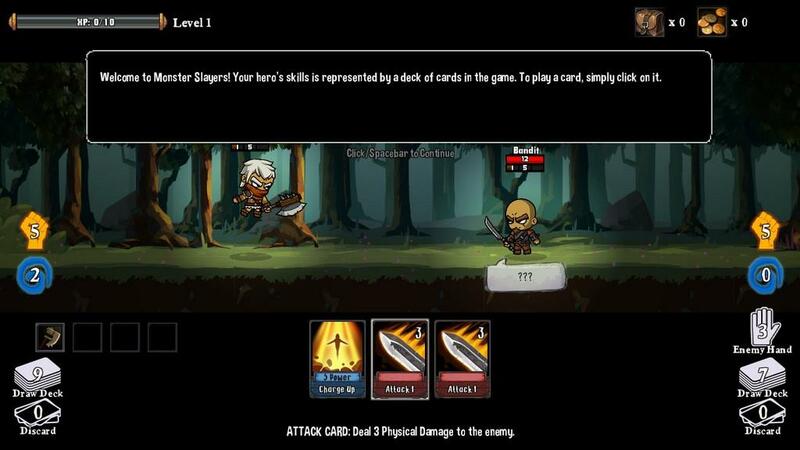 Upon leveling up you’ll gain some more HP and can usually choose another bonus such as more Action Points or another card for your deck. Having more cards sounds like a great idea, right? Well if you’re familiar with other deck building games then you know that’s not necessarily the case. The cards you start out with are somewhat weak, with some dealing minimal damage to start out with. As you progress through a level you’ll find various people who can either upgrade or delete a card in your deck altogether. Upgrading an eligible card will increase its effects such as giving it more damage or giving you some extra protection. Sounds great, but why would you ever delete a card entirely? As you gain more powerful cards you’ll want to start getting rid of your weaker cards. That way you can get to your more powerful cards quicker (once your deck is empty, your discard pile is reshuffled into your deck). Just be careful not to delete your weak cards too soon or you might wind up with nothing to attack with. This adds quite a bit of strategy to how you play and really makes you think about how to fine tune your deck for the current situation. So now comes the fun part. 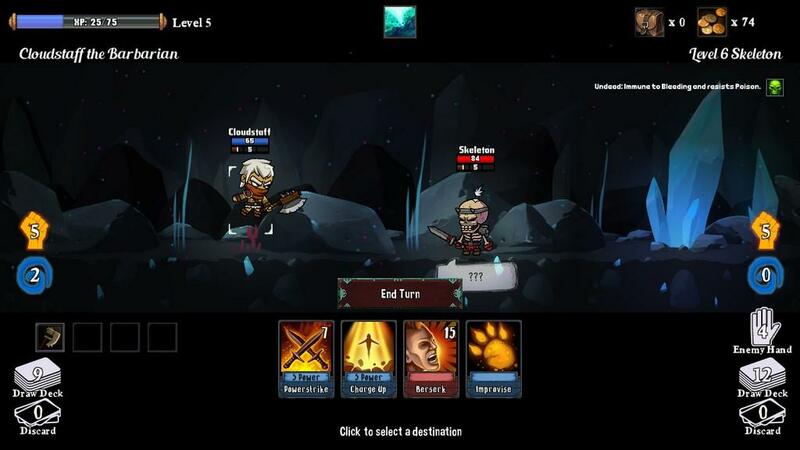 I mentioned earlier that this game was developed by Nerdook, the same team who developed Vertical Drop Heroes and here is where the similarities come in. Early on you will probably die quite a bit, especially as you get a feel for how the game works. Fear not though as after each game you’ll earn Fame. That Fame is added to an ever growing pool and after so much Fame is earned you’ll rank up. After each rank-up you can choose a perk. These perks basically improve the various characters and NPCs in things such as giving them more starting HP or mana, replacing some of their starting cards, and even unlocking more powerful abilities for them or the NPCs. This is how to make major progress in the game. You will die quite a bit, but you’re also improving your characters bit by bit when you do so and sooner or later you’ll have a powerhouse of a character ready to take on anything it comes across. 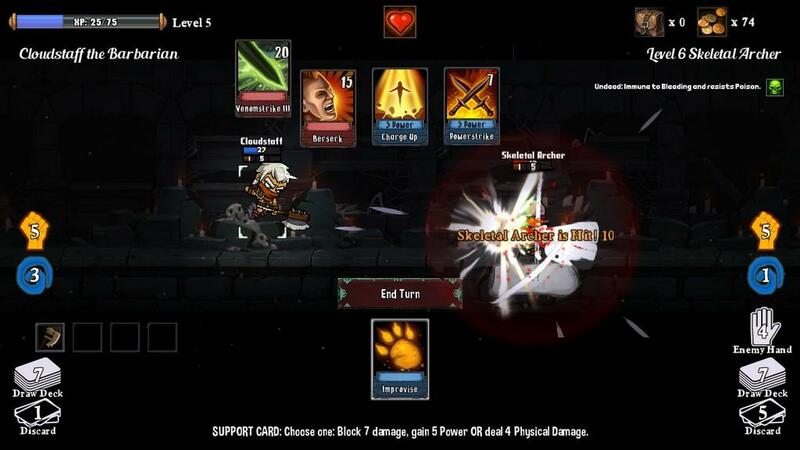 Monster Slayers is a great combination of an RPG and a deck building game. The graphics and music fit the feel of the game and the interface and mechanics work really well. There’s also a lot of strategy in where to go in your current dungeon, should you upgrade or delete cards, should you buy anything from the merchant, and so on. When first playing I can’t begin to tell you how many bad decisions I ended up making, especially when I didn’t even realize I could by rare gear from the merchants to help with future runs. 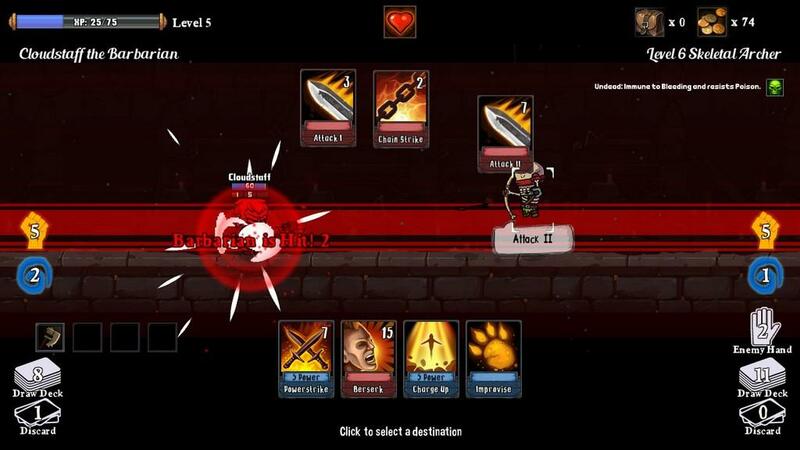 Much like Vertical Drop Heroes, everything you do in one run will help your characters in the future. It may take some time, but stick with it and it’ll be time worth investing. Monster Slayers is a great blend of an RPG and a deck building game. While it’s not as complicated as traditional deck building games, it works really well with the RPG elements of the game. If you’re looking for something different than your traditional RPG…or deck building game for that matter…especially if you’re a fan of Vertical Drop Heroes, you should really enjoy Monster Slayers.